Joseph Fauria, our favorite undrafted rookie, caught a one-yard TD pass from Matthew Stafford, so he naturally busted a move. Fauria only has five catches this season, which seems unfair, considering he's six-foot-seven and succeeding with his limited looks. 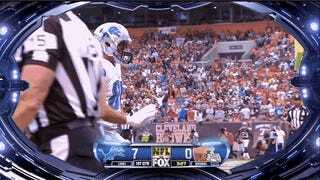 Please continue to find Fauria in the end zone, Matthew Stafford. Mainly for the dancing, but also for the production.